Before :- A. K. Shrivastava, J.
Misc. Appeal No. 2473 of 2004. D/d. 4.4.2005. For the Appellant :- Ku. J. Aiyer, Advocate. For the Respondent :- A. S. Usmani, Advocate. A. K. Shrivastava, J. - This appeal has been filed under Section 47 of the Guardians and Wards Act, 1890 (hereinafter referred as 'the Act') against the order dated 25-8-2004 passed by the District Judge, Raisen, in Misc. Civil Case No. 32/2003.2. An application under Section 7 of the Act was filed by the present appellant that he and respondent were legally married in accordance with the customs of the Muslim Law on 1-11-1999. The marriage was performed at Raisen. The appellant is from Bhopal. After the marriage took place the appellant and respondent resided at Bhopal. 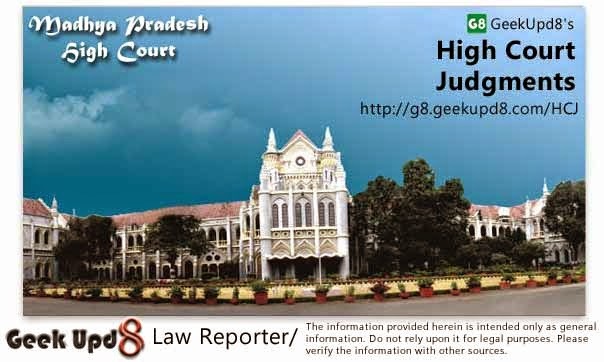 Thereafter some disputes arose between the appellant and the respondent and which is not the subject-matter of this appeal, however, the position which exists today is that the appellant is residing at Bhopal along with his family and respondent (wife) is residing with her parents at Raisen. This fact is no more in dispute that on 29-4-2001 female child was born from the wedlock of the parties. The birth took place at Bhopal. 3. As per the case of the appellant, after the relations became strained between the parties the wife left the company of her husband and started living at Raisen since 12-6-2001. She also carried with her minor female child Mariam alias Juhi. Thereafter on 18-12-2001 the brother of respondent brought Mariam alias Juhi to appellant's house and at that time she was only seven months and 15 days old and handed over her to the appellant by saying that he should take care of his daughter. The appellant apprehended that some mischief may be caused on behalf of his wife and, therefore, he lodged a report on 18- 12-2001 in police station. Since 18-12-2001 Mariam is living with the appellant. On these premised pleadings, it has been prayed by the appellant in his application filed under Section 7 of the Act that being the natural father and guardian of Mariam alias Juhi, he be declared as the guardian of minor child Mariam. 4. A reply was filed on behalf of the wife that she was living with appellant up to 2002 at Bhopal. She is still residing at Bhopal. According to her in the month of June, 2001 her husband (appellant) left her to her parents house. On the occasion of Id festival of 2002 the appellant under the false pretext, to wander Mariam succeeded to take her out from the parents' house of the respondent and thereafter took Mariam to his house and since then she is living with him. The respondent submitted report and also filed application under Section 97, Cr. P.C. and thereafter the appellant has filed this application. It has been prayed by her that this application be dismissed and innocent female child Mariam be delivered to her. 5. The Court below after framing the issues and recording the evidence of the parties came to hold that Mariam alias Juhi is residing with the appellant since 18-12-2001. The story put forth by the respondent that on the Id festival the appellant managed to take Mariam with him is not proved. However, the Court below came to hold that respondent had not abandoned her child. The Court below while deciding issue No. 2 also came to hold that respondent was sitting idle is not proved, on the contrary she was doing the needful to obtain Mariam. The Court below though dismissed the application of appellant but did not direct to deliver the female child Marium alias Juhi to the respondent for the simple reason that the wife (respondent) has not filed a separate application under the Act. Hence this appeal by the husband. 6. In this appeal, Ku. J. Aiyer, learned counsel for the appellant has argued that Mariam is residing with the appellant since 18-12-2001 and till the application was filed by him under Section 7 of the Act, respondent did not care to file appropriate application to take the custody of minor Mariam. It has also been put forth by her that in an application filed under Section 7 of the Act, paramount consideration is the welfare of the minor child. According to her, since 18-12-2001 Mariam is residing with the appellant, therefore, the Court below erred in rejecting the application. She has also submitted that Mariam can be looked after in better way by the appellant instead of respondent, because, he is serving as a teacher while respondent is doing nothing and her father had also retired. In support of her contention learned counsel has placed reliance on Smt. Radha alias Parimala v. N. Rangappa, AIR 2004 Kant 299. 7. On the other hand, Shri A. S. Usmani, learned counsel for the respondent, has argued in support of the impugned order. Shri Usmani has also invited my attention to Section 352 of the Mahomedan Law and has contended that since the age of Mariam is only four years today, therefore, respondent is entitled to the custody of Mariam as she had not attained the age of puberty. Learned counsel has also invited my attention to a single Bench decision of this Court in the case of Sweta v. Dharma Chand Khaddar, (2001) 1 MPLJ 89 : (AIR 2001 MP 23) and has contended that even if no application was moved by the respondent under Section 7 of the Act and if she had made a prayer in the reply to the application filed under Section 7 of the Act by the appellant, the custody of Mariam could be given to her. Shri Usmani, learned counsel for the respondent, has further placed reliance on the decision of the Supreme Court in the case of Smt. Manju Tiwari v. Rajendra Tiwari, AIR 1990 SC 1156 and also a decision of Kerala High Court in the case of Suharabi v. D. Muhammed, AIR 1988 Kerala 30. On these premised arguments it has been prayed by learned counsel for the respondent that this appeal be dismissed. 8. There is no dispute in regard to this fact that the parties are the biological parents of female child Mariam alias Juhi. It is also no more in dispute that the date on which the application under Section 7 of the Act was filed, the said minor child was in the custody of the appellant. Ms. J. Aiyer, learned counsel for the appellant, by placing reliance on the decision of Smt. Radha alias Parimala, (AIR 2004 Kant 299) (supra) has contended that it is the prime duty of the Court to do all acts and things necessary for the protection of minor for they cannot take care of themsleves. The welfare of the minor must be the paramount consideration of the Court and not the wishes of the parties who seek custody or guardianship of the minors. There is no quarrel to this preposition. I fully agree with the submissions of learned counsel that the word "welfare of the child" admits of no strait-jacket yardstick. It has many facets, such as financial, educational, physical, moral and religious welfare. The question, where the welfare of the minor lies should be answered after weighing and balancing all factors germane to the decision-making, such as relationships, claims and wishes of parents, risks, choices and all other relevant circumstances. The answer lies in the balancing of these factors and circumstances and determining what is best for the minor's total well-being. But the question is whether all these things exists in the father only and not in the mother. The contention of learned counsel for the appellant is that since mother (respondent) is not an earning person, therefore, she cannot take care of minor child Mariam alias Juhi properly. According to me, this cannot be a logic to disentitle her from taking the minor child in her custody. Except this ground, no other ground has been raised by learned counsel for the appellant. In the application filed under Section 7 of the Act, there is no averment as such though the appellant has stated this fact in his testimony. It be seen that the mother is not an illiterate lady as she has stated in para 5 of her deposition that she is having M.A. degree with her. She has further stated that she will take care of her daughter and will provide her education. 9. Custody of minor is a sensitive issue. It is also a matter involving the sentimental attachment. Such a matter is to be approached and tackled carefully. A balance has to be struck between attachment and sentiment of the parties towards the minor child and the welfare of minor which is a paramount importance. (See R. V. Srinath Prasad v. Nandamuri Jayakrishna, (2001) 4 SCC 71 : (AIR 2001 SC 1056). 10. Section 17 enumerates the matters which the Court must consider in the matter of appointment of guardians. It is emphasised in both these sections that the welfare of the minor must be the paramount consideration in appointment or declaration of any person as guardian. The cardinal principle is that minors cannot take care of themselves so that the State as pater patrice has powers to do all acts and things necessary for their protection. It is, therefore, the primary duty of the Court to be satisfied what would be for the welfare of the minor and to make an order appointing or declaring a guardian accordingly. It is settled law that the word "welfare" must be understood in its widest sense so as to embrace the material and physical well-being; the education and upbringing; happiness and moral welfare. The Court must consider every circumstance bearing upon these considerations. (See Rajkumar v. Indrakumari, 1972 Jab LJ 1045). 11. In the present case the parties are Mahomedan and, therefore, rights, duties and liabilities of guardians have also been dealt with in detail under the Mahomedan law, the source of which are the Koran and Hadis. Under the Mahomedan Law, while the father is the sole guardian of minors, practically all the authorities on Mahomedan law recognised the right of the mother to hizanat (custody) of the minor children. It is a right to rear up children. There is no material on record that whether parties are governed by Hanafi law or they are Shias. A Hanafi mother is entitled to custody of male children up to the age of seven years and up to the age of puberty in case of female children. A Shia mother is entitled to such custody up to the age of two years of a male child and seven years when the child is female. After the child has attained the above mentioned age, the custody belongs to the father. In this regard Section 352 of the Mahomedan Law is quite relevant. Apart from this, Section 351 of Mahomedan Law also speaks about the welfare of the minor. On going through the evidence and as well as the findings of the trial Court, it cannot be said that any dent can be put on the welfareness of Mariam alias Juhi if she is given in the custody of her mother. I do not mean to say that father may not keep her well or Mariam alias Juhi, will not be cared by the father if she is given in the custody of her father. He may keep his minor daughter Mariam more comfortably than mother. There is no evidence on record in order to show that the father has no love and affection to his daughter. On the other hand, it has come in the evidence that the father is very much affectionate to Mariam alias Juhi. But, looking to the age of Mariam, as today her age is only four years, it would be appropriate to give her in the custody of her mother. Merely I am passing such an order would not mean that the degree of love and affection of the father towards Mariam alias Juhi is less. But looking to the personal law of Mahomedan, I am constrained to pass such an order. Though it has been rightly said that the paramount consideration in the cases coming under the Act for appointment of guardian should be the welfare of the minor, but, it must be as far as possible consistent with the personal law relating to the parties. The preferential right of any person to the guardianship under the personal law cannot be ignored unless he/she is totally unfair to be appointed as guardian and Court must necessarily considers his/her claims in preference to any other. 12. The dominant matter for consideration of the Court is the welfare of the child. But the welfare of the child is not to be measured by money or by physical comfort only. The word must be taken in its widest sense. In this context, I may profitably rely the decision of this Court in the case of Mohammed Mehboob Khan v. Rahmit Bi, (1977) 2 MPWN 79. 13. The trial Court while deciding issue Nos. 1 and 2 came to hold that respondent was not sitting idle and she was pursuing the matter in order to get minor child Mariam alias Juhi back to her custody though she approached a wrong forum by filing application under Section 97, Cr. P.C. which was rejected. 14. In the reply to application under Section 7 of the Act a prayer was made by respondent to give the custody of minor child Mariam alias Juhi to her, the same was rejected by the trial Court on the ground that she had not filed any application under Section 7 of the Act as such the custody of minor child Mariam alias Juhi cannot be given to her in view of Sections 8 and 10 of the said Act. On going through Section 8, it is revealed that a Court shall not pass any order except on the application made by person mentioned in this section. It be seen that paramount consideration is the welfare of the child. A prayer to give in custody the minor child was made in the reply and, thus, it would amount to an application with prayer to give the minor child in her custody. So far as applicability of Section 10 of the Act is concerned, the reply to application of Section 7 in which prayer to give child in her custody has been made there is verification also in terms of provisions of the Code of Civil Procedure. The other requirements of Section 10 are also there in the reply and, therefore, merely because the prayer has been made in the reply would not in itself is a ground to deny the delivery of custody of minor child Mariam alias Juhi to her mother. In this regard the decision of Sweta (AIR 2001 MP 23) (supra) relied on by learned counsel for the respondent throws sufficient light. This Court on 13-1-2005 directed to deliver the custody of Mariam alias Juhi to respondent and she was allowed to keep her till next date and in pursuance to the said order minor child Mariam alias Juhi is in custody of her mother. (viii) if the respondent creates any hindrance or violates any of the directions which I have mentioned hereinabove, the appellant shall be free to file necessary application in the Court below under the Act to take back the child in his custody. 16. The impugned order is, accordingly, modified and this appeal is disposed of accordingly. The parties are directed to bear their own costs.